You’ve gotta hand it to Gareth Edwards, he managed to pull through with Rogue One: A Star Wars Story and deliver a huge win for Disney. Throughout the summer, the project was plagued with one concerning news report after another, all pointing to some troubling reshoots and unwanted studio meddling. In the end, however, the first of the Anthology films turned out more than alright, and proved that this format can definitely work for the iconic franchise. 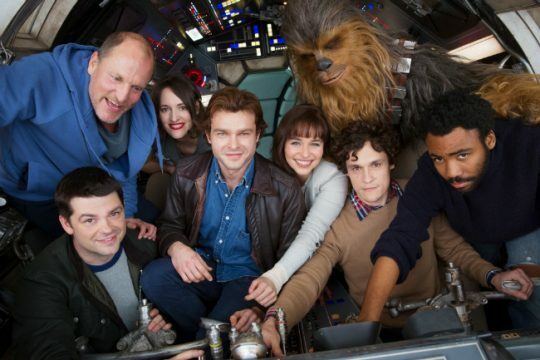 Now, all eyes have turned to Phil Lord and Chris Miller’s Han Solo spinoff to see if lightning can strike twice. It’s still far too early for us to have any indication of whether or not the 21 Jump Street directors are going to deliver, but at least one cast member has full faith in the filmmakers’ vision. And that’s Woody Harrelson. The actor is set to have a large role in the movie, playing the mentor to the titular hero, and in a recent interview with Collider to promote Wilson, he had some encouraging words to share. It’s not uncommon to hear talent hype up their film, but it’s nice to see that Woody’s so confident in the upcoming Anthology pic, even going so far as to call it the best one yet. That’s a bold claim, given that the Star Wars franchise has brought us some of the greatest movies of all-time, and while we’re hesitant to fully believe him, we’re certainly excited by his comments here. After all, Lord and Miller are two extremely talented directors, and they’ve put together a wonderful cast, full of some of Hollywood’s brightest young actors (Donald Glover, Alden Ehrenreich, Emilia Clarke). All signs are pointing to another thrilling Anthology film then, and with Star Wars Celebration right around the corner now, we expect to learn a lot more about Disney has planned with their Han Solo spinoff very soon.